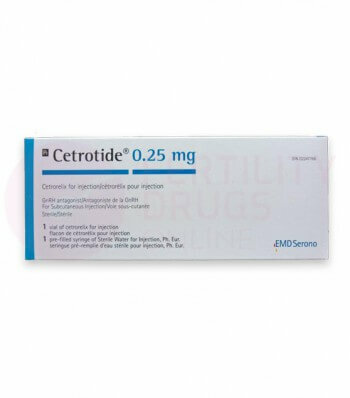 Cetrotide is a gonadotropin-releasing hormone antagonist (GnRH antagonist) injection drug with the generic name Cetrorelix, which comes in the form of a powder for solution and injection. During in vitro fertilization (IVF) treatments or other fertility treatments, the drug can help control ovulation to release eggs when they are mature and the IVF technicians are ready to harvest the eggs. This helps to ensure the best quality eggs are available for fertilization in the IVF clinic. In clinical studies, this injectable medication seemed effective at preventing a hormonal surge in about 95 to 97 percent of patients. Doctors usually prescribe the drug to women undergoing IVF treatments. The drug injections help to prevent premature ovulation when a woman is undergoing controlled ovarian hyperstimulation with another drug. The cetrorelix in this remedy works by blocking a hormone found naturally in the body, called a luteinizing hormone releasing hormone (LHRH). This hormone normally controls the production and release of the luteinizing hormone (LH) which triggers ovulation, but since Cetrotide has blocked its release, the LH does not trigger ovulation. This helps to prevent premature ovulation, allowing the eggs to mature before they are released. The IVF technician can then harvest mature eggs to fertilize in the lab, giving the IVF treatments the best chance of success. Your doctor will give you instructions on how and when to inject the drug, and you can also refer to your product insert. The fertility doctor will usually give you your first injection in the clinic, monitoring you for about thirty minutes, then allowing you to continue the rest of your shots at home. Inject this medication subcutaneously, which is under the skin, in your lower abdomen. Inject the medication slowly, and vary the location of the injection each day to reduce irritation. Your doctor may prescribe this medicine, which you should inject every twenty-four hours, either in the morning or evening. You will likely start injecting it on day five or six of your ovarian stimulation, continuing to take one shot daily until the morning your fertility doctor has planned the release of your eggs. Your doctor may prescribe 3 mg instead, which they will likely administer as a single dose on your seventh day of ovarian stimulation. If needed, you may then start injecting the drug daily starting four days later. Once you have mixed this drug, use it immediately and discard any unused medication after your injection. Always follow your doctor's directions for injecting this medication. Seek medical attention immediately if you experience any of these symptoms. These may not be all the possible side effects. You should not take it if you are allergic to it, any of its ingredients, or any similar hormones. Do not inject this medicine if you are pregnant or breastfeeding, if you have finished menopause, or if you have severe liver or kidney disease. Store the drug in a cool, dry place away from heat, moisture, and light. Keep this injectable medication and other fertility drugs, needles, and syringes out of the reach of children. Your doctor will usually prescribe Cetrotide as part of an in vitro fertilization (IVF) treatment. You may receive a Cetrotide prescription along with a prescription for a follicle-stimulating hormone (FSH) such as Gonal-f. The FSH will stimulate follicles to form, producing eggs, but the Cetrotide will control the release of these eggs until they are mature and ready for harvesting. You may also use a fertility monitor or ovulation test to determine when you are ovulating, and the best time to conceive. Premature ovulation is the release of eggs from follicles before they are mature. Some hormones control the growth of follicles which produce eggs, but other hormones control the release of these eggs. When a woman undergoes IVF treatments, she may produce a greater number of eggs when taking follicle-stimulating hormone (FSH) drugs, but a natural surge of luteinizing hormone (LH) may release these eggs before they are ready. These immature eggs cannot be fertilized in the lab, and the woman is forced to undergo another round of ovulation stimulation. Drugs like Cetrotide IVF injection can help control the release of the eggs, preventing premature ovulation and allowing the eggs to mature before they are harvested for fertilization. With the high cost of IVF treatments and all the fertility drugs involved in the process, parenthood can seem out of reach to some couples. We are a Canadian pharmacy and can help you order affordable Cetrotide and other fertility drugs, with free shipping. Your first step is to speak to your IVF doctor to find out which fertility drugs are best for you, then once you have a prescription, bring it back to us. You can place your order online or by phoning our customer service hotline and one of our partner pharmacies will ship your order, ready to help you time your ovulation for the best chance at conception.